Former Marine, Jerry Pitts, came with his wife and three children from Memphis, Tennessee in 1971 to start his new job as Chattanooga’s Chief of Police. Five years later, Pitts was campaigning for the job of Hamilton County sheriff. During the 1976 campaign, he strongly emphasized his wish to establish a more professional police force. 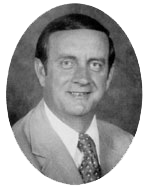 Soon after his election in 1976 as the county’s first Republican sheriff since 1958, he began to implement many of the changes he had emphasized during his campaign. Some of the new Sheriff’s goals and changes created disagreement and worry among many department personnel throughout his entire term of office. Nevertheless, Sheriff Pitts believed that his reorganization plans would streamline the department and prepare it for the future challenges to law enforcement. While in office, he managed to enlarge the traffic patrol division, reorganize the investigative division, and assign the bookkeeping and accounting division to general county government. The department also underwent a name change during his stay in office as Pitts chose to call it the Hamilton County Police Department.